"Holy Guacamole, this is good!" Those were the first words out of my nephew's mouth as soon as he could (sort of) politely speak after downing a batch of this Guacamole Recipe and a half a bag of taco chips. That did it, I knew this recipe was destined for the book. 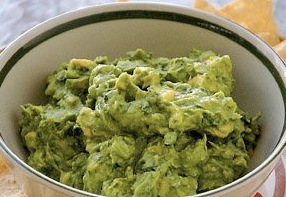 A great guacamole recipe can do more than top a taco chip. This one can even share the table with your Shabbos appetizer salads, it's a healthy sandwich spread and perfect complement for any Tex-Mex recipe like Chipotle Salmon Fish Cakes. In the work bowl of a food processor, pulse onion, cilantro and jalapeno until finely chopped. Add mayonnaise, lime juice, and avocado. Pulse briefly until mixture is the consistency of chunky guacamole.